Click on the graphic below to view it on the XKCD site. 1. In xkcd he always adds something to the picture in the title tag (e.g. to appear as a tooltip when you place the mouse over the image), so when you show the image elsewhere it may be a good idea to copy that as well. 2. Hotlinking? And without attribution? Each of these alone is extremely rude and uncivilized. Considering that it looks like you usually don’t do that, don’t start. Thanks for stopping by, Yaron. About attribution, I followed the directions on the XKCD site for placing the comic on a blog, but I have altered this post to go above and beyond those directions to make the source more clear. Regarding your general charge of attribution absences, I can’t really speak to those without some specifics since from my point of view I do routinely attribute where it’s warranted. This graphic was not originally hotlinked anyway, so what are you talking about? Many of the Nerd Fun posts are Blogthing tests which don’t require any special attribution. XKCD is “a webcomic of romance,sarcasm, math, and language” by Randall Munroe. Here is more information on Munroe’s background for anyone interested. Huh. In my world, it’s awfully rude and uncivilized to drop by someone’s house and criticize the manners of the hostess. Thanks Holly. I added the tooltip to the post, though since it’s not in the instructions for using XKCD in one’s blog I have no idea if that’s something Munroe would appreciate or the opposite. First of all, I’m sorry that I was not clear on attribution in general. I meant to say that generally I find that you do attribute pretty much everything (whether hotlinked or copied), and so it’s even a better idea to do so now (contrary to someone who may not attribute as a rule, and so probably don’t care). That part wasn’t a criticism, I just should have phrased myself clearer. And attribution may be as simple as saying where the image was taken from, or linking it to the original site. Now it’s done well, but when I commented the only way for anyone to see that the picture came from xkcd was to view the source of the page and look at the image tag. That’s not attribution. And I personally don’t get comments like “don’t require attribution” when the discussion isn’t about legality. If you take an image from someplace, and you know the source, and you expect people who read your blog to enjoy it, the cost of saying “this came from X”, or linking to X, is minimal. It’s polite, it covers legal issues on cases where attribtion may be required (it takes much less time to link than to search for a licensing policy), and it’s even useful for your readers who may wonder where they can get more of the same. As for the hotlinking issue, whenever you include an image that comes (every time it is viewed *on your site*) from *someone else’s sever*, that’s hotlinking. That is, if the img tag links to something on a domain that doesn’t belong to you (e.g. xkcd.com), that’s hotlinking by definition. It’s what the term means. If you copy the image to your own server, it’s not hotlinking. If you use the image from the source server, it’s hotlinking. When anyone reads this post, the image is being taken from xkcd, from bandwidth dedicated to the xkcd site, without the reader getting anything else from xkcd except for the image. 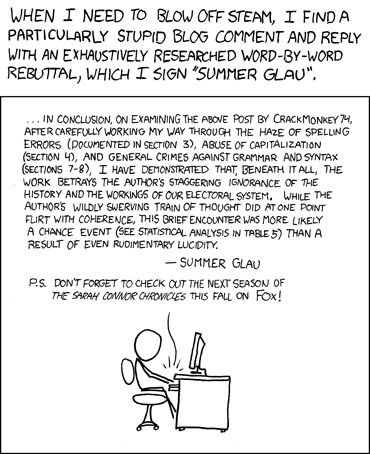 In this specific case it’s much less rude than usual, because on xkcd he explicitly allows it. But just because someone says it’s fine to act with him in a way that is generally considered bad, doesn’t mean you have to. At least IMNSHO. About the tooltip, it’s a part of the story the comic tells, so adding it is a good thing. 1. A blog is not someone’s house. It’s someone’s location in a public space. It’s perfectly fine to criticize people who act in bad manners, towards other people not with them, on their front lawn near the street, or in an area in a public park. 2. Lisa, as I wrote but not clearly enough, usually doesn’t exhibit these bad manners. So my assumption was that it was an unintended slip. And as such I consider it perfectly fine to comment on it. If I visit people, in their home, and they do something which very rude without knowing it, I’ll consider it a good thing to let them know so they won’t accidentally repeat it in the future. 3. This isn’t rudeness in general, which wouldn’t have been my business as a “guest”. This is rudeness towards someone else who isn’t present. If you were visiting someone’s home, and the hosts would have shown you their new TV, still carrying a stamp stating it’s the property of the neighbour next door, would you think it’s rude and uncivilized to at least mention to the hosts that stealing is considered a bad habit, and the TV at least looks like it was stolen? I see. Well, clearly you are all in the right here, and I am merely an ignorent worm in your presence, so I withdraw any judgements I made upon you or your behavior, O Lordly Commentor of whom I have Never Heard. I’ve been working as a web developer for almost 15 years and would never link to an image on someone else’s server unless it was expressly stated as OK — as you have also noted that XKCD does. I figure Munroe wants to be able to track views on an image and he can’t do that if I copy it and put it on my own server. Thanks for noticing that I typically follow general attribution courtesies. I haven’t thought about the tracking angle. If true, it would definitely be very unusual. Normally there aren’t people who are actually interested to have their images hotlinked elsewhere, just people who don’t care (i.e. not interested in pageviews on their site, and don’t have any BW shortage). I assume the “don’t care” is the case for xkcd. It’s a big world out there. There are millions of people with Internet access. Very few of them are famous, and I’m certainly not one of them. So I’m not at all surprised you have never heard of me, just like you never heard about most of those millions. What I am surprised about is the idea that the merit of an argument is strongly affected by whether the reader heard about the one stating the argument or not. When judging what people say, who they are should be negligible in comparison to what they actually say. The thoughts are the same, whether they’re signed with my name, or with Summer Glau’s.